On June 30, I will be doing an SEO for WAHMs (Work at Home Moms) workshop under Manila Workshops. We’ve seen a lot of WAHMs show interest in learning about how to do SEO, based on the recent Facebook Live session care of FH Moms. 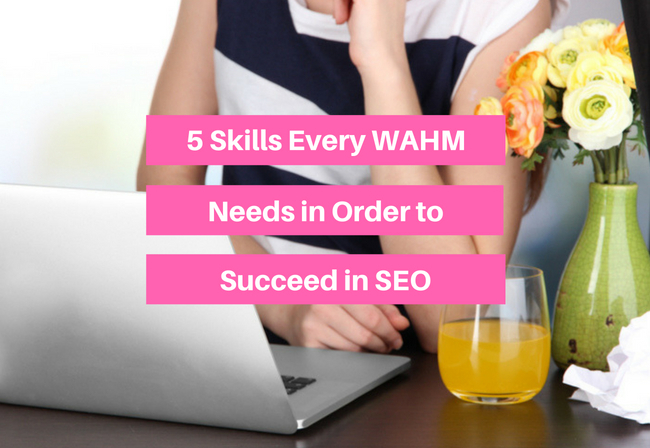 Many ask: What does it entail to be an SEO WAHM? What do you need to have or possess in order to actually start a career in SEO? As you all know, SEO can be a bit technically overwhelming even for internet-savvy moms. But as with anything, if you choose to learn it – then you can make it! Today, I wish to discuss the core skills a work at home mom needs to have to gain some ground in SEO. I’m going to share based on my own experience as a long-time SEO professional, and mother. These tips are not exactly etched in stone, but will definitely help you in your quest to become an SEO specialist. Lots of it. Because you will be starting from scratch, learning about keyword research, metatags, website structures, link building, etc. – It’s going to entail patience and time on your part. Depending on your learning curve, I’ll be honest to say you can’t claim to be expert in just 1 month of learning. It’s continuous education. But after a month, I’d say you can go ahead and start with some basic SEO tasks like keyword research, and link building or link outreach. I think this holds true for anything in life, actually. But for SEO clients, they pose very specific problems, i.e. “We want to rank on the first page of Google for a particular keyword (search term). “ Other clients, however, do not know what their real challenge is, and that’s where you come in. One needs to have a sharp problem-solving skill in order to identify a website’s pain point in terms of SEO and figure out possible solutions to solve the problem. This can mean looking at a website’s search competitors and how they resolve the same challenge. Inwardly, you need to be able to run a good SEO audit to determine which needs fixing. One of the reasons why moms have a potential to be good in SEO is because most women are good with words and marketing. Because SEO is a marketing discipline, it’s important one has a good grasp of basic writing, how to integrate keywords in a copy, and how to come up with meta descriptions (which you will learn in the workshop) that can entice a person to click on your search listing in Google. From competitor research to keyword research – all these require basic research skills, which I think most moms are good at. We’re the ones in charge of scouting for family vacation trips, household stuff, gifts, etc. We have a knack for knowing what’s popular, what works, what’s in demand. We’re good at this so let’s put it to good use. Being able to analyze your data and drawing conclusions that impact marketing strategies and business decisions is one of the most rewarding parts of SEO. When you can tell the CEO of a company that he needs to invest more in search marketing because that’s where the bulk of his buyers are coming from – then that’s a result of good data analysis. Another example is to analyze which keywords are driving sales versus keywords that only bloat your traffic. Knowing this can help the client decide which keywords he will target if he plans to launch paid search campaigns like Google Adwords (a different topic, altogether). If you’re truly invested in pushing your work at home career a notch higher because of the time flexibility and income potential of SEO, then I suggest decide to learn the craft and practice the 5 skills I mentioned above. Becoming SEO cannot be done overnight, but there is a good return on investment when you finally get a grasp on how it’s done.